Gina Din – With a Pinch of Masala! I had the pleasure of meeting this down to earth lady a couple of weekends ago and thought she’s just amazing. It takes a lot for me to get star struck so you’ve got to be believe me that she has a lot to strike anyone. Cool, calm, poised, well-dressed were the first impressions and as the evening progressed I established that she is a genuinely warm person. No airs and graces and lovely laugh to match! So I got hold of her and asked her a few questions to find out what makes her tick. If you could come back in another life, would you be male or female? – Female! I love being a girl. What was your Plan B in life? – This is my Plan B. When I was growing up I planned on having 6 kids and not working!! On the work front, I feel very lucky that handling so many of Kenya’s blue-chip companies gives me a great perspective to the inner workings of many of the country’s most succesful companies, across the entire private sector and the incredible minds that run them. I am lucky to have learnt so much from my clients. Indeed most of our clients are the very engine of Kenya’s economy so I feel really lucky to be part of them. I totally love the diversity of what I do for routine would bore me to bits. Its great just being part of a different company every day. I am really proud of the Kenya Red Cross and the great work that they do. As the goodwill ambassador, the only one in Africa, its so satisfying to be involved in such a well run and independent organisation. I am really enjoying my role and want to spend more time raising awareness of the different programmes. When was the last time you really got angry? Do you spend a long time in front of the mirror? What was always written on your school report? – ‘Gina is wasting not only her own time but the time of the teachers as well.’ I was not a great student! I wasnt the sharpest tool in the shed at school and didnt enjoy school at all. So I tend to place more focus on people as a whole and not just their academic qualifications. Its takes a lot of different aspects to make one interesting but I have loads of respect for those that are completely clever and do enjoy studying. – I am happy most of the time. I find it hard to not enjoy each moment. Life is such a gift so I just don’t dwell on things that make me sad. I try very hard to remain positive and grateful for my life and for my children. 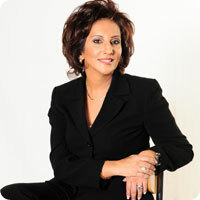 Gina Din is a wonderful person and she empowers us women to achieve the best in our lives.